The Silentaire Val-Air 100-24 AL Ultra-Quiet Compressor offers noiseless air pressure delivery to air brush artist tools. One of the biggest challenges professional air brush artists face is environmental noise. 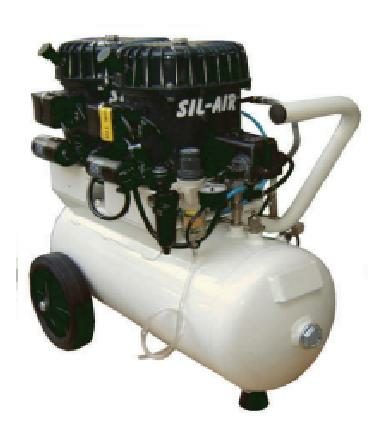 The Silentaire Val-Air 100-24 AL compressor is a "noiseless" unit that offers continuous, silent delivery of air pressure to air brush paint application. Designed and engineered with all automatic components, the unit comes outfitted with an air tank, tank pressure gauge, line pressure gauge, pressure regulator with a built-in moisture trap, air intake filter, and safety valve. The ultimate in portability, this industrial quality air compressor unit comes with a carry handle and wheels for easy-pull mobility. The Val-Air 100-24 AL is equipped with a heavy-duty .5 horsepower "AL" pump. The pump features an aluminum head and automatic cooling fins. An in-line coalescing filter for oil mist elimination prevents rust. In 110Volt/60Hz, 220volt/60Hz and 220volt/50Hz voltage units.